Remember the 60’s when the Beatles saved Pepperland from the Blue Meanies in the Yellow Submarine? 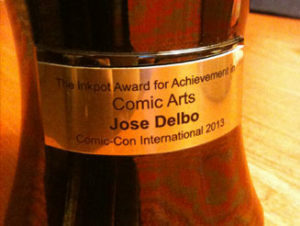 Well, I was the cartoonist responsible for illustrating the Fab Four with Gold Key Comics does. I am an Argentinian born artistwho published my first work at the age of only 16. I was inspired by the American cowboy westerns, moved to the States and began work on classics like Billy the Kid, Judge Colt and the Lone Ranger. Then in the 70’s, I brought a host of television shows to comic book form with titles such as the The Twilight Zone, The Brady Bunch, Hogan’s Heroes, Buck Rogers, The Monkees and the Mod Squad. Back in the 80’s, long before the modern superhero dominated the big screen, I worked for the likes of DC and Marvel Comics who penciled the published adventures of Superman, Batman, Aquaman, Green Arrow, The Transformers and The Thundercats. Then in the 90’s, when the focus fell on the environment, I helped the country go green when he drew the first issues of Captain Planet and the Planeteers and Brute Force. I continued to be the go-to-guy for cartoon classics like Disney’s 101 Dalmatians, Little Mermaid and the Mighty Ducks. When the NFL needed a superhero, I drew the NFL Superpro who ran around with Spiderman fighting crime in the big city. My eclectic career also includes published illustrated comic books featuring some of our cultures most iconic women such as Raggedy Ann, Little Lulu, Barbie and Wonder Woman. 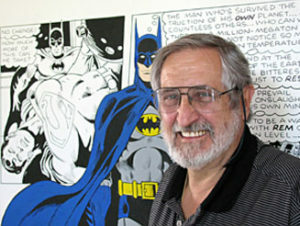 I have also illustrated cartoons for the past 50 years for comic book fans across the world and in several languages. My original comic book pages have been displayed in museums, private collections and can often be seen trading on internet sites. As a former vice-president of the National Cartoonist Society and industry celebrity, I have been featured on various news and entertainment television programs and founded a Cartoon Camp for young cartoonists originally housed at the International Museum of Cartoon Art. My most recent works take his art to new heights, six foot tall painted murals. They are detailed, original hand-paintings. Larger than life, these acrylic on canvas works of art recreate comic book original pages done years ago. “My art is a journey of passion. As a young child my world was a pencil and paper. Drawing was the only thing that interested me and to date this passion to draw continues. My art has always been on the pages of comic books, but now I found a new method to showcase these pages by painting them on canvas. I feel that the largeness of the pages brings a sense of exhilaration to my artwork.